It’s not surprising that we think of vegetables as inanimate objects. After all, we generally buy them in gigantic stores where, displayed in the next aisle over, might be anything from beauty products, pharmaceuticals and miscellaneous hardware items to winter gloves, engine oil and even laundry baskets. While it’s not hard to see a distinction between a green pepper and a snow shovel, it never dawned on me to give it much thought or attribute any significance to the obvious differences. Until I began researching best practices for vegetable storage. That’s when I learned that separating a vegetable from its mother plant might hasten the time when it becomes compost, but picking doesn’t kill it. Consequently, successful vegetable storage is all about creating optimal conditions for keeping vegetables alive as long as possible after being detached from life support. 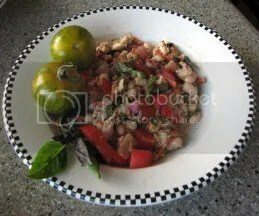 Experiment with something other than a green salad for lunch, like this tuna and white bean salad that served as a vehicle for using up extra white beans cooked for a kale soup we made in our classes. Providing wonderful vegetable connection are the last of summer’s tomatoes, cucumbers and basil. More recently, I realized that the aliveness of vegetables and fruits could have a significance far beyond proper storage methods, i.e., as a comforting connection to something real in our very non-real technological wonder of a world. Check out what you think of that theory then go cut up some vegetables and see if it rings true in practice. Here’s how I used up some vegetables from my garden yesterday.